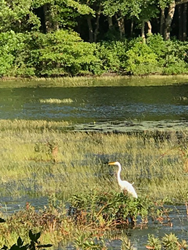 Inside the Massachusetts community of Centerville, organizations model working together to offer sustainable business practices in support wild life. The project also supports the health and well being of ducks, osprey, heron, turtles, and even herring and other fish. This pond and herring run depend on this restoration project for survival. Because the project involves a cross section of property owners and community members, we are all working together for the restoration of our beautiful community. The Christian Camp Meeting Association (CCMA) of Centerville, MA, owners of the Craigville Retreat Center, has made a commitment to becoming a Net Zero Community by 2050. This means that the CCMA is taking steps, along with other participants, towards becoming a community that is 100% sustainable and supports the natural waters, wildlife and community. The CCMA is working with the suitably named nonprofit, Red Lily Pond Project, which is an independent nonprofit focused on the health and restoration of Red Lily Pond and Lake Elizabeth. The Red Lily Pond borders the village of Craigville and is the beautiful backdrop of the Craigville Retreat Center. The pond’s waters, and the sustainability of its herring run, depend on this restoration project for survival. The project also supports the health and well being of ducks, osprey, heron, turtles, and even herring and other fish. The Red Lily Pond Project’s focus is on healthy waters, while CCMA will be lending its focus on energy and waste reduction. United, Camps, Conferences & Retreats, the nonprofit that manages the Craigville Retreat Center, will also do their part by being a leader in modeling the best ways for saving energy, waste reduction, and environmentally sustainable business practices for the rest of the surrounding village. “Because the project involves a cross section of property owners and community members, we are all working together for the restoration of our beautiful community” says Bill McKinney, spokesperson for the CCMA. In doing so, the Craigville leadership will use best efforts to reduce energy use, focus on healthy waters, and approach waste in an environmentally sustainable way. The CCMA was founded in 1872 when members of the ecumenically-minded "Christian Connection" established a camp meeting ground now known as the Craigville Retreat Center, which is a series of buildings that host nearly 12,000 guests/year and is managed by United Camps, Conferences & Retreats. Other project members are The Red Lily Pond Project, The Craigville Beach Association and The Craigville Cottage Owners Association which represents the owners of the 90+ private homes that surround the Retreat Center. Work is currently underway to help the CCMA meet its goals so that future generations may enjoy Craigville.